You can customize our landing page designs in any html editor and update it according to your needs. On purchase of a landing page design you get all the source file like Landing page design source PSD, Fonts used in the design and hand coded html/css which is seo and google friendly. Our landing page designs are affordable and reasonably priced. Premium, fast and simple payday cash loan online application small lead capture form landing page design with beautifully designed content sections for 3 easy steps, video, testimonials and frequently asked questions. 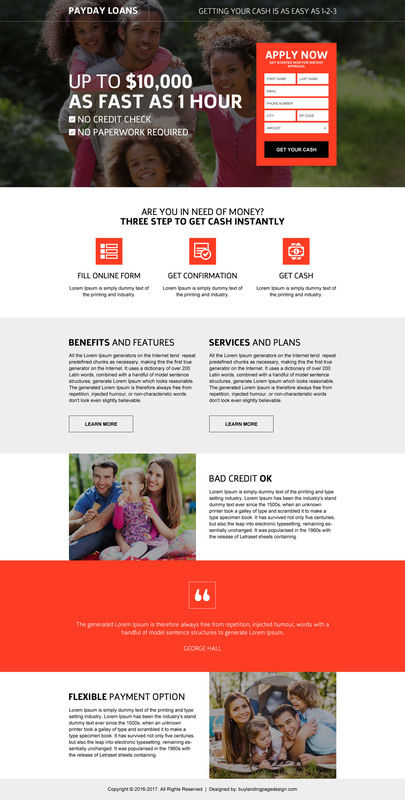 Payday cash loan online small lead capture form landing page design to capture online application for payday loans with clean and organised content sections. 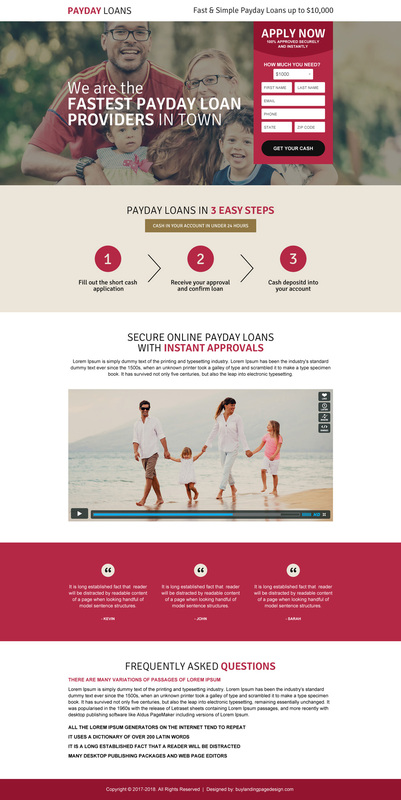 Appealing payday cash advance loan landing page design with attractive and clean content sections along with strong call to action buttons. Online payday loans online application lead capture form landing page design with strong and attraction call to action buttons through the page. 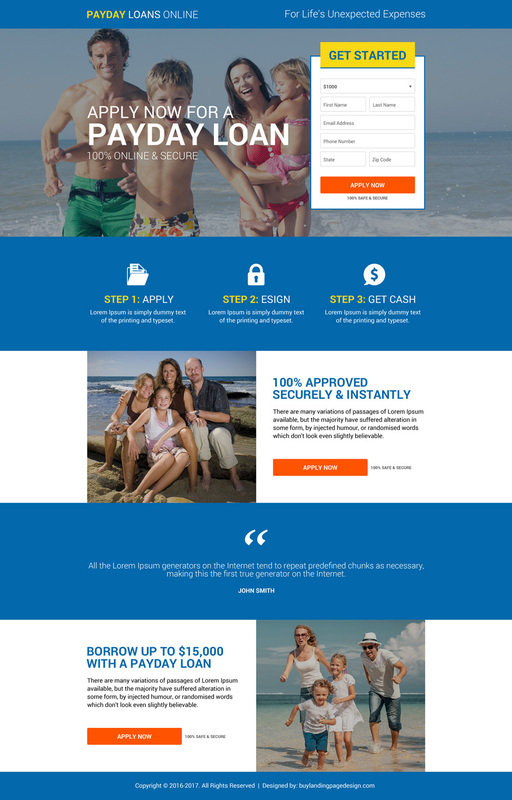 Personal cash loan modern and latest landing page design with strong call to action buttons. 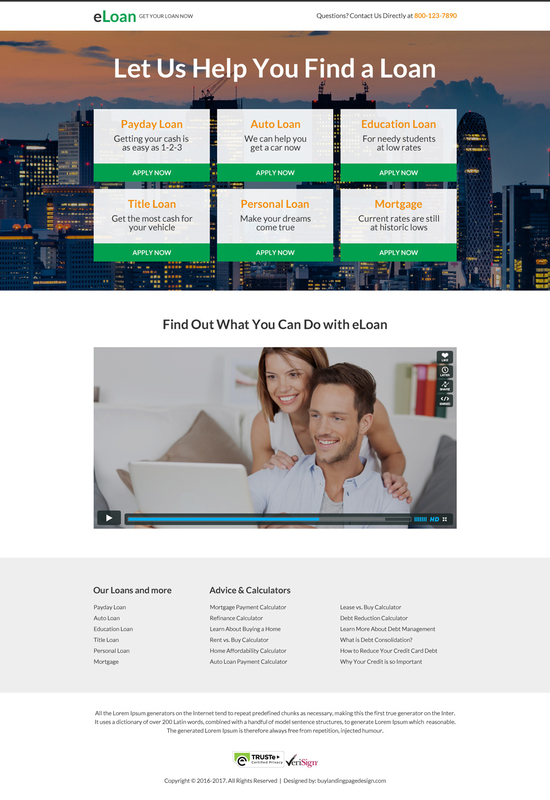 E-loan landing page design for promoting and capturing leads for payday loan, auto loan, education loan, title loan, personal loan and mortgage. It is a very clean and user friendly landing page design with option to add an introduction video. 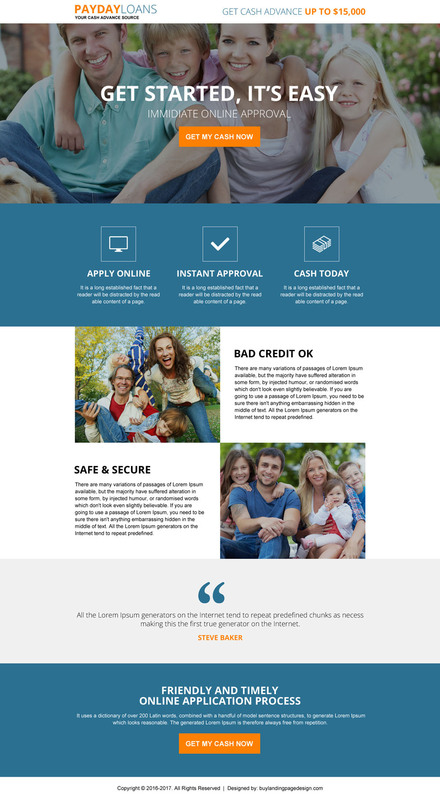 Premium cash loan landing page design for promoting payday loan, auto loan, education loan, title loan, personal loan and mortgage services. Attractive and appealing “how it works” sections to showcase your cash loan process in an appealing way. You can place your customers review and showcase an informative video for your customers. 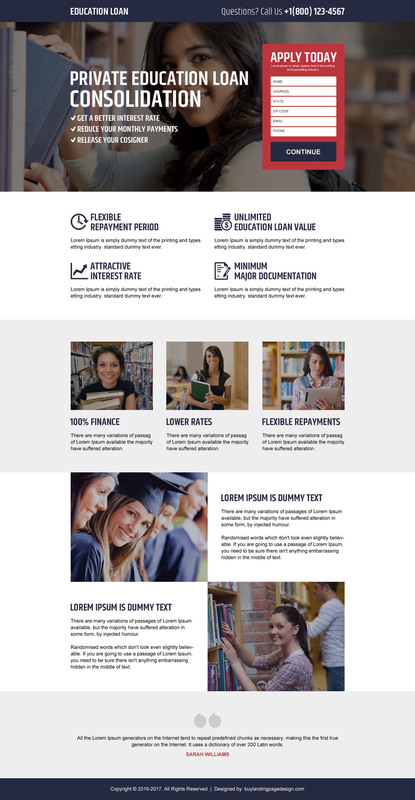 Private education loan consolidation small lead capture form landing page design for online application with smart and clean content section placement. 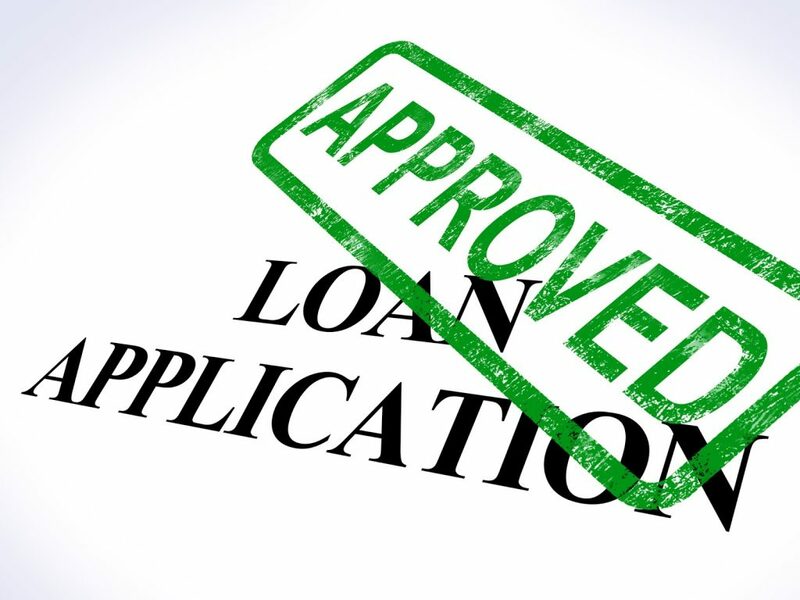 Do you have a business to give loan against property? Use our professional property mortgage landing page design to promote your business online. 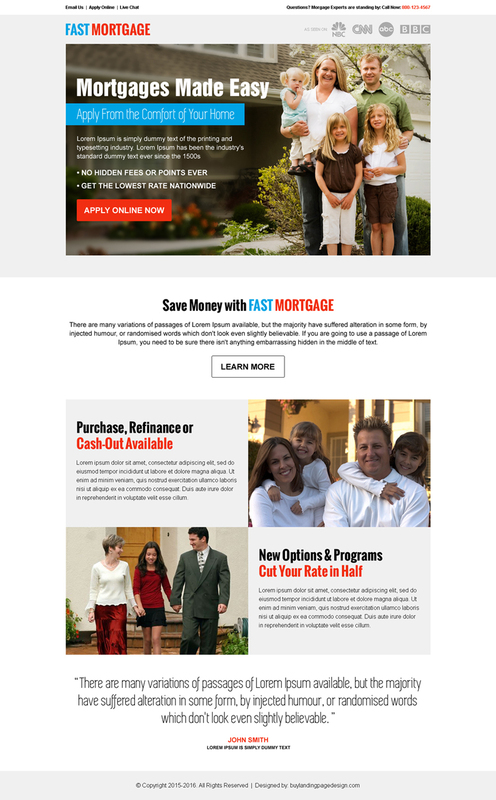 Our optimized mortgage landing page designs collect lead and boost your business conversion. Purchase, refinance or cash out mortgage landing page design with user friendly content sections and appealing call to action buttons throughout the landing page. Mortgage refinance quotes lead capturing landing page design with beautifully designed content sections and lead capture form. Simple and minimal mortgage refinance center landing page design with 2 column small lead capture form on top. 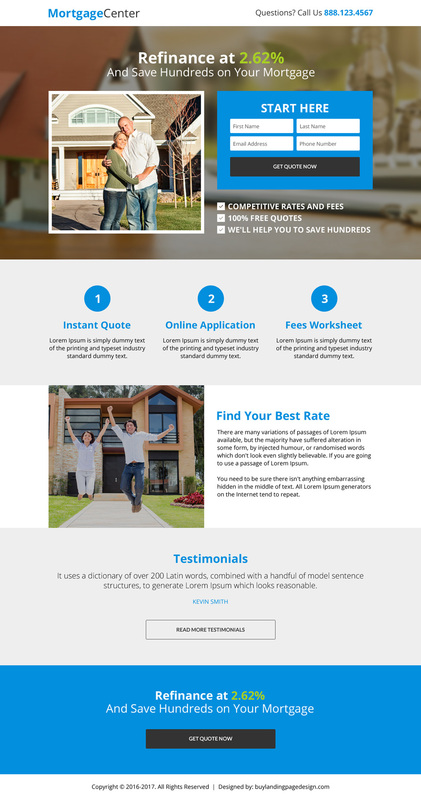 Mortgage refinance small lead capture landing page design with plenty of space to insert your quality content. Need a custom design? Get a custom design done by our expert landing page designers at a very affordable price now. Request a free quote for your custom project now.